Actually this one sentence says it all. Just in case I will explain a little more. When you were a child there may have been a time when you fell and cut your knee open or maybe you were chopping things and cut your finger. When that happens, it usually takes a few minutes and then the blood coagulates – it stops bleeding. Of course it is a good thing to disinfect the wound and to put a plaster over it. Yet, within a few days you don’t even think about it anymore. Your body has healed itself. Illness is caused because you are not listening to what the body is telling you. Your body is always talking to you. When everything is fine you feel good and happy. When discomfort sets in, then your body may react with a headache, pains and aches or maybe a kind of sluggishness, tiredness etcetera. Why is this actually happening? Imagine when things in life get busy, hectic; you may have experienced a trauma or a shock and possibly even a loss, your mind has to deal with it. First you might think thoughts that may bring you down. Those thoughts could be about others or possibly even about you. Believe me, your body always listens when you think and since it is a very intelligent organism, it reacts to it with a feeling. Thoughts produce feelings! Makes sense so far, right? Feelings are a powerful catalyst within the body, therefore your brain and cells do their best to accommodate your thoughts and feelings. A happy mind lives in a healthy body or vice versa. If your thoughts are positive, then the outcome in your body, in your life and around you is positive. Change your mind and you will get another outcome. Often your body is very kind and might just give you a little symptom like a cold. Let’s say you would experience a sinus problem where it feels difficult to breathe. Ah that’s not so bad, is what you may think now and yes, you are right. Well if you ignore that feeling, then your body has to think of something else to make you aware that ‘something is wrong’! Let me take you a little deeper into the sinus problem. If you were walking into a swimming pool, you would walk and then eventually when the water would get to your nose, you would most likely swim, otherwise you could not breathe anymore. With the sinuses, you have stopped swimming and have continued walking in the water until you could not breathe anymore. In other words, your body is telling you: “Enough is enough!” You are doing too much of something that does not agree with you. You need to rethink and see where the thoughts and feelings began that made you uncomfortable. Are you working too much? Do you feel abused or hurt by someone else? Have you neglected yourself for too long? What is happening that is causing this discomfort? Once you ask your body what it is trying to tell you, you have a good chance to ‘change your mind’ then change your feelings and then, only then healing will take place. Imagine how easy it is to be healthy, when you are in control and when you consciously pay attention as well as fully understand what is happening in your life / body. Understanding is so important and acknowledging what your body is telling you. The key is in everyone, all you need to do is to look for it and to ask yourself what is happening in my life that causes discomfort in my body? and it is happy to give you an answer since it wants to be healthy. Sometimes the answer might come as a dream, as a message in the media, you may read something in a book or magazine or someone happens to tell you something that is absolutely relevant to your question. All you need to do is to be aware and to make note of what information you are getting. Some issues may be from the past and something that has happened now might trigger the button again. The key is to be patient and persistent. 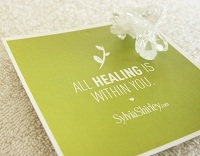 Your body wants to heal; it just needs you to want to know what you can do to heal it. By the way, lessons are sometimes wrapped in illness, therefore I recommend for you to look at what the lesson is teaching you. Understand it and move forward. If you don’t listen to the small signals your body is giving you, it will make sure at some stage you will listen. There is no need to go there and if you did, there is always a chance to return to where you want to go – to being happy and completely healthy. Doctors will help your body and so will the medication or energy healing as well as many other therapies, yet the real healing begins in your mind, your feelings and then your body. If you need more clarity about what your body is telling you, I will be glad to assist you on your journey.